The availability of adequate, efficient, and affordable infrastructural facilities both economic and social constitutes the core of development strategy and efforts. In the absence of infrastructure services, enterprises are forced to seek higher-cost alternatives which impact profits and production levels adversely. In India, the demand for infrastructural services has increased rapidly since industrial liberalization of the economy. Unfortunately, infrastructural bottlenecks remain the biggest stumbling block of industrial progress in the country. By their very nature, infrastructure projects involve huge initial investments, long gestation periods, and high risk. This book examines the problems and inadequacies of various sectors of economic and social infrastructure in India. 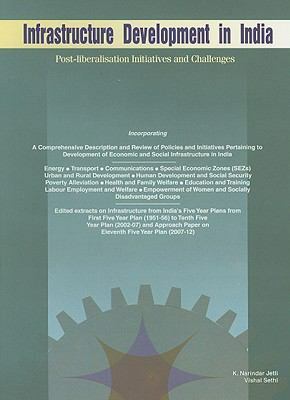 Changes in infrastructure policy and new institutional arrangements for infrastructure development are also discussed.Jetli, K. Narindar is the author of 'Infrastructure Development in India: Post-Liberalisation Initiatives and Challenges', published 2007 under ISBN 9788177081404 and ISBN 8177081403. Loading marketplace prices 3 copies from $85.16 How does the rental process work?